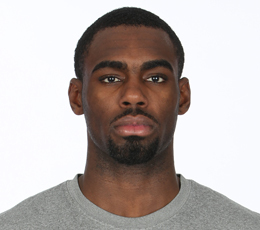 Full Name: Tim Hardaway, Jr.
- One-on-one Tim Hardaway Jr.
Hardaway has been projected by many draft analysts to be a late first-round pick. The son of former Golden State Warrior star Tim Hardaway, Sr. has NBA size and scoring ability. But he’ll have to get stronger so he can handle his defensive assignments. Hardaway helped lead Michigan to a 31-8 record and the NCAA tournament championship game. Along the way he was chosen first-team All-Big Ten by the league’s coaches and second team by the media. Hardaway was a workhorse all season, averaging 34.8 minutes a game. In 2012-13, Hardaway producedcareer highs in scoring (14.5), rebounding (4.7), assists (2.4), field-goal percentage (43.7) and 3-point percentage (37.4). "Tim has worked very hard to develop his game during his time here. He has prepared every day for this opportunity. We know he will work just as hard or harder to make his dream a reality. "He's a different player now; you can just see it. Confidence wise, pull-up jumpers, getting to the basket. … it's tough for people to guard him."